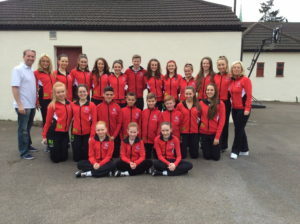 Welcome to the Maguire O’Shea Academy of Irish Dance. The school has been established for over forty five years by Michael and Kathleen Maguire. Along with their children Darren, Katie & Ellie, they have produced an exceptional amount of world class dancers who have then gone on to perform with shows such as Riverdance, Lord of the Dance and Prodijig. From left to right Ellie and Michael Maguire perform at the Royal Albert Hall for the President of Ireland’s State Visit. Check out the video below. The MOS dancers entertain thousands of Rugby fans at the England V Ireland match at Wembley. The young MOS dancers give Jordan & Perri a run for their money as they perform on their tv show Jordan & Perri’s Ultimate Block Party at the Nickelodeon Studios.